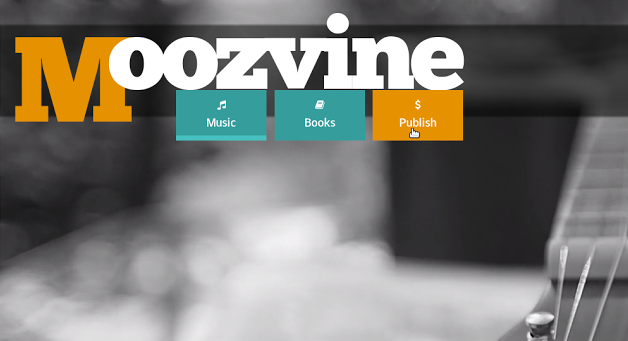 Moozvine is a combination of digital publisher and crowd funding platform. Its mission is to revolutionize the way we publish books and music in the digital age. The current models provide too many restrictions on content both for the consumers and the creators. Readers can no longer share their favourite books and music with friends. New authors and musicians are finding it harder to reach a wide audience because the concept of sharing has been destroyed by digital copyright rules. As Bruce Willis discovered, parents cannot even pass their iTunes collections down to their children – imagine not being able to share your lifetime reading with your own kids? Moozvine’s approach turns the system on its head. Authors produce work and set a price (a threshold for publication) on their work. The community pledges money towards releasing the book (or music) to the public. The work is then published under a Creative Commons licence. This means that anybody can read it, email it to friends, share on social media etc. The work is set free. This may sound daunting to authors and musicians, but the potential is huge. A book that is released may “go viral” and be shared by thousands, or more. While this will not provide the author with any immediate financial benefit, their fans can follow their author pages and when the next book (or song / album) is released the fan base is ready to pledge towards the release. Many great authors are currently lost in the depths of the archaic publishing system – if they are not favoured by a publisher their work is essentially lost forever. With Moozvine authors can build up their fanbase with each new book, story or poem and this will allow them to set higher thresholds. Although authors will not receive royalties on future sales, this system aims to give a fairer share to the author (around 90% of all pledges goes direct to the author, the remainder goes towards running Moozvine). If you have ever worked as a ghost writer this will already be familiar – you get paid for the work that you write. However, because this only affects digital publications a successful author is still free to have their work printed and sold in shops if they chose to take this route. If the work really goes viral they may also earn from selling the rights to derivative works such as film or television productions. As an incentive to get the ball rolling Moozvine has launched a short story competition and a music competition with first prizes of $1000 and second prizes of $500 for the short story (less than 7000 words) and music publication (3 to 6 tracks) that have collected the most contributions before December 31, 2014. If my short story gets released, I plan to put it up on my Jon Wade blog – it will also be on Moooozvine! Now is the time to dust of those old manuscripts and tapes and set your music free.